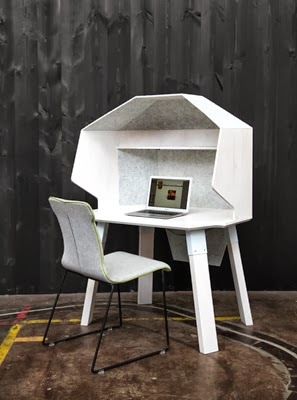 Perfect for the kid who doesn't want to his work to be copied at school, perhaps, but better suited to the design savvy worker who's looking for a mobile office for one, this Desktop Acoustic Privacy Booth is a portable, versatile screening device that’s easily moved around the workplace or home. Made from plantation timber, the booth is called The Hoodie and is available in a range of upholstery fabrics and with options for lighting, power and data, shelving and storage. It is designed by Koskela and is up for a 2013 IDEA award. The Hoodie by Koskela. Photographer: Ashley Jones.